The pork industry’s use of gestation crates, which keep pigs immobilized, is one of the worst forms of institutionalized animal abuse in existence. In fact, these crates are so cruel they’ve been banned in nine states and the entire European Union. Just last year, a study by the World Health Organization placed processed meats like bacon and sausage in the same carcinogenic category as asbestos and smoking cigarettes. Piglets are taken from their mothers when they’re as young as 10 days old. After having their tails cut off, their teeth clipped, and their testicles ripped out without any painkillers, they’re packed into filthy, overcrowded pens. With thousands of animals crammed into a single farming facility, millions of tons of feces, urine, and blood require disposal. The result is massive toxic waste lagoons that can become so taxed they overflow and seep into water tables, rivers, and streams, creating a toxic mess. 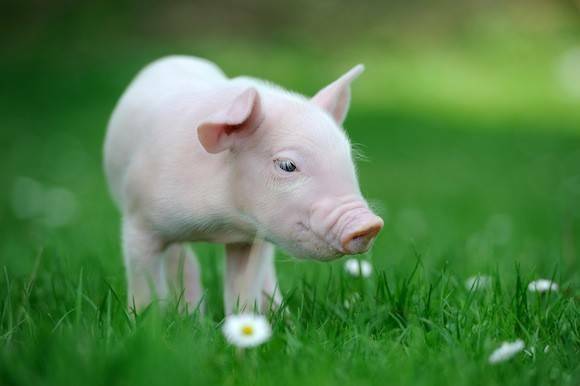 Piglets who are too sick or who aren’t growing fast enough are gruesomely killed. Many are slammed headfirst onto concrete floors, and others are tossed into overcrowded gassing carts where they slowly suffocate from CO2. On factory farms, antibiotics are used to make animals grow faster and keep them alive in conditions that would otherwise kill them. Bacteria can develop resistance to these antibiotics, making it virtually impossible to treat humans who become infected by these "superbugs." Unfortunately, not a single federal law protects animals during their lives on factory farms. The Humane Methods of Slaughter Act pertains to cows and pigs only at the slaughterhouse, providing zero protection to them for the majority of their lives. In 2013, Porcine Epidemic Diarrhea Virus (PEDV), an often fatal diarrheal illness, killed a tenth of pigs raised for pork. Last year, Fox News reported that farmers were combating the epidemic by feeding pigs manure containing the virus or remains of dead piglets who were infected. As countless MFA investigations have documented, many pigs are left to suffer from open wounds, serious injuries, and infections without proper veterinary care. As long as factory farmers prioritize profit over animal welfare, animals will pay the price. Researchers at Loma Linda University School of Public Health found that vegetarians had a lower risk of obesity, hypertension, diabetes, and death from all causes. Consuming high amounts of processed meats like bacon can increase your risk of premature death by up to 44 percent. Pigs are considered the fifth-most intelligent animal in the world—even more intelligent than dogs—and are capable of playing video games with more focus and success than chimps! Despite this, factory farmers treat them as meat-producing machines. We can take a stand for animals, the environment, and our own health by ditching pork and other animal products. For a list of delicious vegan bacon recipes, click here.